On the way to work the other day I stopped off to pick up something to eat. As I sat inside I noticed somebody wearing headphones go up to the counter. When it was his turn to be served he kept them over his ears, preventing verbal communication. This stuck me as odd. That he chose deafness instead of having a simple conversation with the server. I’ve seen something similar in Marks and Spencer at lunch time. 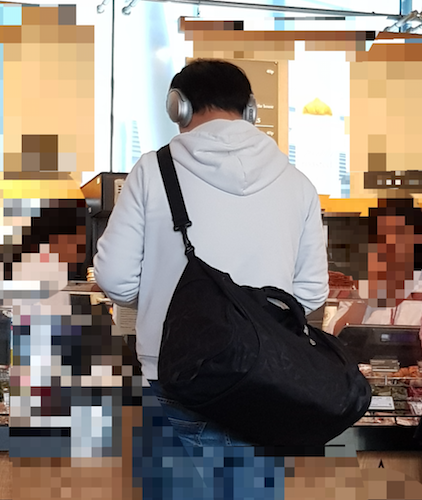 Customers were queueing up with their headphones on, and the staff member had to direct them to tills by holding up the right number of fingers. On the London Underground I was barged out of the way by someone leaving the carriage. It could have been an aggressive gesture until I saw the blank look and headphones. Headphones appear to primarily reduce audio attention, which is critical when driving as audio cues can be the first warning sign of an unexpected event. At 75km/h (46mph), a difference in reaction time of 0.3 seconds means a difference of 6 metres in distance travelled, which could be critical in an emergency situation. Robin Christopherson talked about the importance of redundancy for those who are audibly or visually impaired. Wearing headphones while driving removes the redundancy of noise while also distracting us. I’ve been deaf in one ear for as long as I can remember. I compensate by sitting on the end of the table in restaurants, or find it more difficult to talk to the person on my right. I may tell them it isn’t personal, and that I’m not ignoring them deliberately. I ask my children to remove their earphones when crossing the road, and I do it too. Here’s an AA report from 2016 about pedestrian smartphone distraction. Maybe you use headphones as a distraction. Or to practise mindfulness. Whichever it is, please be clear on whether it’s enhancing or undermining your experience.